Many Mars scientists believe that a lot of water must still be on Mars, locked into frozen or liquid underground reservoirs. Recent results from the Mars Global Surveyor orbiter may indicate that liquid water may still burst out onto the surface from underground before disappearing into the atmosphere. The 2001 Mars Odyssey orbiter has also discovered large amounts of subsurface ice. If aquifers are present in the upper 3 kilometers (about 2 miles) of the crust, a radar signature would reveal it. Near-surface aquifers may be present due to active thermal processes or low-thermal-conductivity sediments. Detection of these sites could provide targets for future instruments designed to detect life and to provide water resources for future human exploration. An underground zone of liquid water will have very different electrical properties from the surrounding rocks and it will reflect very strongly. Scientists should be able to see the top of a liquid zone somewhere in the upper 2-3 kilometers (1-2 miles) fairly easily, and may be able to go down to 5 km (about 3 miles) or more. 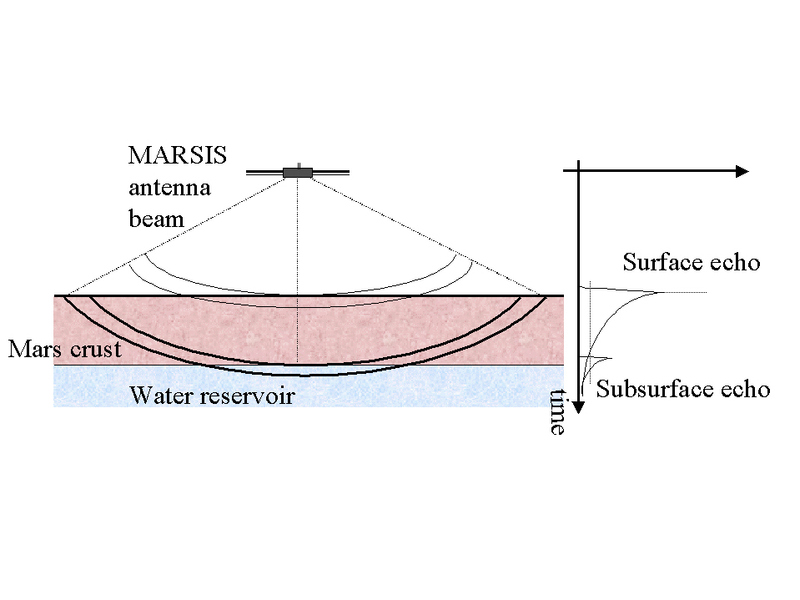 The radio waves will be reflected at any interface, not just that between rock and water, so MARSIS should reveal much about the composition of the top 5 kilometers (about 3 miles) of crust in general. It should, for example, pick out layers of rock interspersed with ice, which are more likely to exist close to the Martian surface than liquid water. Scientists should be able to measure the thickness of sand deposits in sand dune areas, or determine whether there are layers of sediment sitting on top of other material in areas hypothesised to be the sites of ancient lakes or oceans. They may even see the boundaries between different lava flows. Scientists will also use this instrument to study the ionosphere to see how the solar wind affects the Mars' upper atmosphere. Known as the ionosphere, the upper atmosphere of Mars at altitudes greater than 80 kilometers (about 50 miles) contains free electrons that are produced by the ionization of gases in the martian atmosphere. During daytime, the peak concentration of these free electrons occurs at around 130-150 kilometers (80-93 miles) above the surface of Mars. Low-frequency radio waves cannot penetrate high concentrations of free electrons and if the frequency is sufficiently low, the radio wave reflects back. This principle is used in the radar to map the electron density profile of the ionosphere by transmitting a number of pulses at different frequencies. The best ground-penetrating studies are made during the night when the martian ionosphere is least active and when the spacecraft is less than 800 kilometers from the martian surface, a condition that occurs for 26 minutes during each orbit. During the day, sunlight ionizes the upper atmosphere (charges it up electrically) and long wavelength radio waves bounce off it. Those that are reflected from the ionosphere can reveal much about its structure. MARSIS will measure the electron density in the ionosphere and hence quantify the effect of charged particles streaming out from the Sun (the solar wind) on the upper atmosphere. Such measurements will complement those of other instruments whose prime task is to find out whether the unremitting depredations of the solar wind over billions of years have stripped Mars of much of its atmosphere.